20mm WWII Lamercraft Elhiem x6 British tank crew burying a comrade, 3 men in denim overalls, in batt..
20mm WWII Lamercraft Elhiem x5 Fallschirmjager Engineers laying demo charges, wearing a mix of tropi..
20mm WWII Lamercraft Elhiem x5 German field marshal, senior officer with three staff officers in att..
20mm WWII Lamercraft Elhiem x5 Germans in mixed padded two piece winter camoflage. 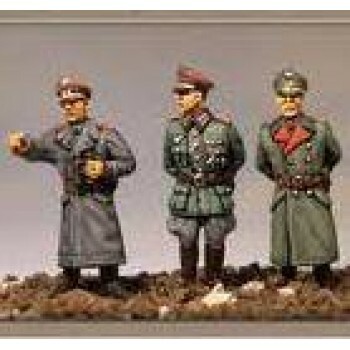 (5 figures)..
20mm WWII Lamercraft Elhiem x5 Mixed German Waffen SS and army figures seated and standing on vehicl..
20mm WWII Lamercraft Elhiem x7 Waffen SS Tank commander with mixed crew, wearing black uniforms. Sui..
20mm WWII Lamercraft Elhiem x5 US Tank crew, bailing out of a brewed up tank. (5 figures)..
20mm WWII Lamercraft Elhiem x5 British in mixed uniforms standing around tank having just dismounted..
20mm WWII Lamercraft Elhiem x5 Waffen SS tank crew burying a comrade. In mixed uniforms and a grave ..
20mm WWII Lamercraft Elhiem x5 British tankers in denim overalls taking Waffen SS prisoners. Suitabl..
20mm WWII Lamercraft Elhiem x5 British guard in windproof uniform with German prisoners. Mixed unifo..
20mm WWII Lamercraft Elhiem x4 Waffen SS Men in mixed uniforms standing ready for action as if inter..
20mm WWII Lamercraft Elhiem x5 WaffenSS Standing and sitting on their tank, wearing a mixture of pan..
20mm WWII Lamercraft Elhiem x5 Waffen SS Panzer Grenadiers with wounded. Casualty evacuation, wounde..